The Flashback Trojan is a relatively new Trojan family, appearing on the scene late last summer/early September 2011. Since it's inception, there have been numerous variants - moving from being a pure social engineering play (appearing to be a fake Flash update) to leveraging exploits. The rapid evolution of this family has made it a little confusing to stay on top of. There were reports of Twitter being used for C&C updates as part of an early March variant. However, it is unclear if this communication avenue was ever actually used by the botherder. Then there is the question of what the Trojan does/is doing. It has the capability to modify web pages (web-injects) viewed in Safari, based on a configuration file received from the C&C. However, it is not clear exactly what the web-injects will be used for. Similar functionality exists in many other bots, such as Zeus and is typically used to include additional form fields on banking sites to gather additional information such as SSN, debit card number, pin, etc. Finally, there is the question of how widespread the infections are. Dr. Web has reported 550K infections. Which would certainly rank this among the largest botnets. Some have claimed the numbers to be over-hyped or mis-counted. However, Kaspersky recently published a blog confirming the and even upping the number to 600K+ after sink-holing a C&C. HTTP GET requests to this and other related C&Cs is done with a base64 encoded User-Agent (UA) that includes the CPU, hardware UUID, OS version, and other system/infection details - so each victim has a unique UA when connecting to the C&C. The latest variant does not appear to use this same UA encoding. We are seeing a number of the related websites on 67.208.74.71 (InfoRelay Online Systems). There are a large number of interesting looking/suspicious domains that are or have have resolved here, including numerous ".rr.nu" sites. 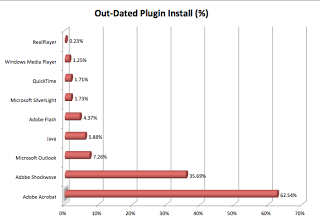 We'll close out with statistics on the browser plugins that we are seeing among our enterprise customer base. These stats were collected by querying the browser DOM during customer-logins, which allows us to identify browser plugins/extensions. We are currently seeing only about 6% of Enterprise systems with an out dated version of Java. Percentages of out-dated versions of Acrobat for example are much, much higher.